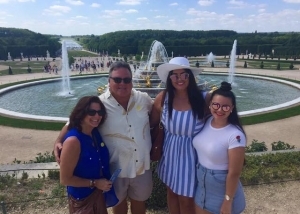 We flew from Miami to London, stayed in a lovely flat in Kensington, close to transportation and the sites, then on to Paris to an apartment right across from the Seine River and near Notre Dame and finally on to Venice and an amazing hotel on the Grand Canal. (My fav!) Everything was first class (not kidding, flights included) and again I state, was truly the trip of a lifetime!